It’s November again, National Novel Writing month, i.e. NaNoWriMo only has one more week left and people need some way to get through the slog and finish their word count goal of 50,000 words, the length of a short novel. November 30th is the deadline for NaNoWriMo. Though any deadline can be met with this refreshing way to reach word count. Any word count goal large or small can be met with this outlining method that is flexible and fluid. If you are writing a novel you may find it more helpful to break up your word count goal into 1,000 words as novels have word counts in Thousands. For NaNoWriMo, 50,000 words in a month is quite a task. Sneaking 50 words at a time breaks it down and adds up especially if you write in short bursts of time. What to Meet Word count For. NaNoWriMo is only a few weeks long and if people want to reach their word count, they need a system in place such as an outline to keep them on track. The good thing about outlines is they can help you keep things in mind as you write so you won’t be blocked and can meet your word count. The bad part is they can also keep you locked into a plot. Not so with this method. In order to keep word count in mind, it is helpful to have a chart on hand with a map and number counts to keep you on your path. 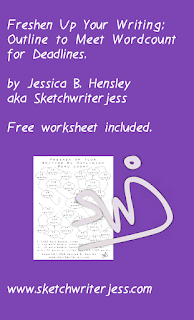 I’ve included one worksheet in this article free to download and use. First there is an overall word count goal for a section. 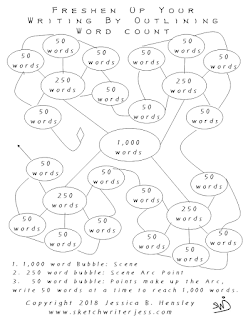 For novelists, 1,000 words works because novels’ word count totals are counted in Thousands. This is the scene. Second, next set of word count goals breaks up the thousand into four parts of 250 words a piece. These sections define the major points of a scene in order to make way for the story path, also known as the story arc, though these small sections form a basic curve of the arc they are better handled broken up into smaller pieces. Third, it’s time to break the 250 words into smaller chunks of 50 words a piece. This makes it possible to write small pieces that add up. You’ll be surprised how fast 20 minutes of writing goes. Also where you write has an impact on how much gets done. When to Outline and Write Your Story. Before you start your outline it’s a good idea to pick a time of day as well as a day of the week to begin your outlining process. This is true whether you are first writing your story or in the middle of your tory. This process allows you to outline as you write your story. I you pick the morning hours you have the whole day ahead of you. I like the morning because I feel like I have all day to get carried away with my story. I can write as long as I want. I’m also more alert too. If you pick the afternoon you get to wake up later then if you can also have a working lunch. It’s a nice way to spend the afternoon. You still have time to get carried away in your story. And if you pick night time as an option, you can dine and write. You can be around more people cause they are coming home from work. You can also take breaks and make more rewards for yourself since it’s the end off the day. You can still get into your story but there will be more time to tie up loose ends the next day. Next, it’s time to choose a day or more to reach your word count goals. If you work outside the home you might want to write on your day off so you can choose what time of day you want to write without worrying about other things that need to be done for the day. Where you write outlines and your story. I like to go to a fast casual restaurant, Panera, because you can buy a coffee and pastry and sit and write as long as you like. Also you can find people doing work at Panera like you are. It’s inspiring to see people work in a well lit space and be able to focus even if there is noise. The coffee shop is another place you can go though it’s usually small and gets crowded fast. Plus sometimes they can be dark. It’s nice to see people work here too. All though most people keep to themselves. One last place to spread out your writing tools and get to work is home. Home is great because you can save money and you can write any time of the day you want. I find that a three hour block of time in one place helps me use this method best. Once you get into it, you could write shorts bursts in between other work that needs to get done. What I recommend in addition to finding a spot to write is to be consistent in time and day. That is if you spend a three hour block writing in the morning on Sunday at Panera, then keep doing that. If you want to change things up a bit, then pick another day and time in the same or different location to keep things fresh. Always keep the first appointment you keep to yourself. One more thing I’d recommend is to have some background noise. If you are out, chances are there will be music and ambient noise o industrial cooking appliances and people talking. However if you are at home, I recommend putting on some background Music. I like instrumental Jazz from the BGM Channel on YouTube. Once in awhile I watch sports, or put on a crime drama just to change things up a bit. How to write and outline as you go. When I find my place to write and I have my time blocked out, I get out my pad and a pen. I use a legal pad for articles and a small legal pad for books, this month I used it for my novel. I also like to have my word count diagram of the word count mind map in front of me. Plus I like to use a timer for writing sprints. A writing sprint is a short burst of time used to write. I use a timer on my smart phone called the OK Timer. You can set hours, minutes, and seconds and hit start to count down. It has a nice stops sound. It doesn’t startle me like a kitchen timer beep. To start the outlining process, I use a blank sheet or paper or lined paper in a composition book since I like to write notes in addition to using this process. 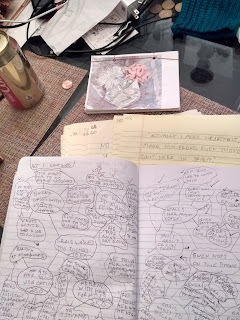 I start drawing the mind map with the 1,000 word bubble in the center of the page. This bubble has the name of the scene. Then I draw four lines extending from the main bubble. 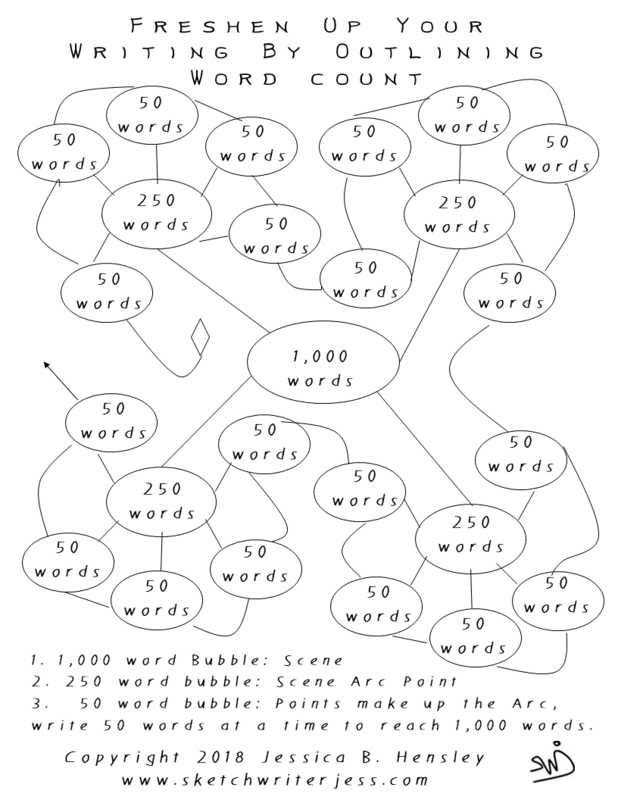 I write the scene arc points from each line, bubbles are 250 words. After that, I draw the points that will make up the arc of each point of the scene. Each of these bubbles are 50 words. There are five lines, five bubbles per 250 of the scene arc points. These 50 word points are connected to form the scene. 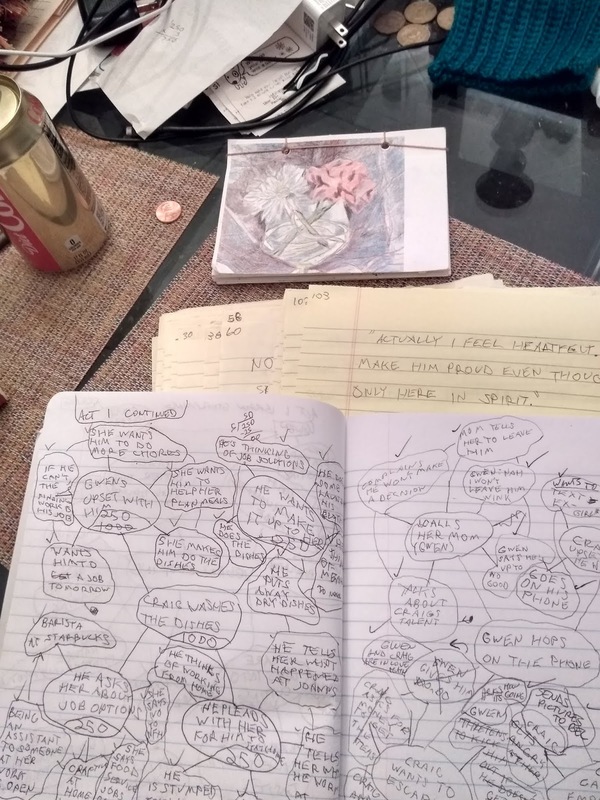 The overall goal is 1,000 words, that 1,000 words is broken up into quadrants at 250 a piece, then the 250 words are broken up into 50 word chunks. You only need write 50 words at a time to reach 1,000 words. It’s best to draw the lines, write the word and then draw the bubbles to contain the words. Also leave some space around the bubbles so you can add words and cross out words as you go. You can even cross out whole bubbles if you are ahead in word count. 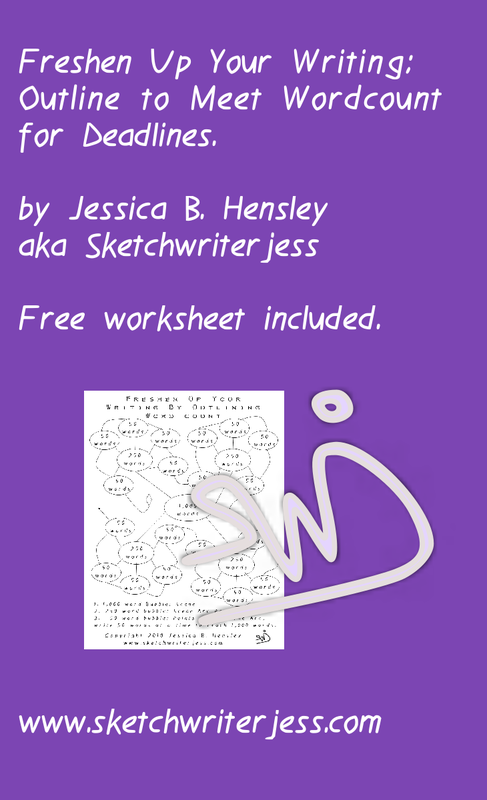 Here is the mind map worksheet with the word count. It’s free to download. Just save the image and print it. I’ve also include some instructions on it for you to keep in mind as you use this method to write our story. I’ve used this method to start writing my novel. I’ve made a 5 act structure with 10,000 words per act. I write 1,000 words at a time. One thing I do is type up the words so I know the word count and see if I’m ahead of count if I’m ahead of count. The problem is I’ve written so much that I haven’t typed the words in until 30 pages by long hand double space. I’ve got over 100 double spaced written pages many times I’m ahead of my goal word count, when I started, I hand counted the words. I found I was at 70 words per page more often then 50 words a page so it just kept adding up. One advantage of hand counting is you can see if you are ahead of word count. I was able to write this article more efficiently because I could cut out some bubbles and join some bubbles together by enclosing them in a larger bubble by drawing a line around the bubbles to make a circle. I have enjoyed using this process cause I can see it add up. Here is a picture of my pile of written pages and my composition book with my outlines. I had a writer-friend tell me its like a bible, at first I thought, not really, but now I think it sort of is.